It is located behind the larynx and goes from the upper border of the epiglottis to the lower border of cricoid cartilage anteriorly and lower border of C6 vertebra posteriorly. 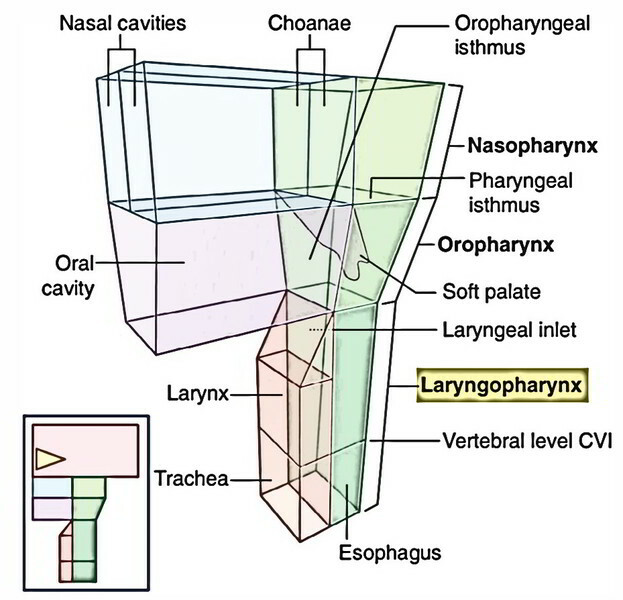 The laryngopharynx is located behind the laryngeal inlet and posterior wall of the larynx. Via laryngeal inlet it conveys anteriorly with the laryngeal cavity and at the pharyngoesophageal junction (the narrowest part of the GIT with the exception of appendix) inferiorly with the esophagus. Posterior wall: It’s supported by the bodies of C3, C4, C5 and C6 vertebrae. Lateral wall: It’s supported by thyroid cartilage and thyrohyoid membrane. Anterior wall presents laryngeal inlet and below the inlet it’s supported by cricoid and arytenoid cartilages. Lateral wall presents piriform fossa 1 on every side of laryngeal inlet. The piriform fossa is described in detail below. It’s a deep recess broad above and is narrow down below in the anterior part of lateral wall of the laryngopharynx, on every side of the laryngeal inlet. These recesses are generated because of bulging of larynx into laryngopharynx. Medial: Aryepiglottic fold and quadrangular membrane of larynx. Lateral: Mucous membrane covering the medial outermost layer of the lamina of thyroid cartilage and thyrohyoid membrane. The internal laryngeal nerve and superior laryngeal vessels pierce the thyrohyoid membrane and traverse underneath the mucous membrane of the floor of the fossa to get to the medial wall. Above: Piriform fossa is divided from epiglottic vallecular by lateral glossoepiglottic fold. The piriform fossa is deep in ruminating animals where it acts as lateral food channel to express the bolus of food during deglutition by the side of closed laryngeal inlet. It’s occasionally, unnaturally deepened by smugglers using lead balls to conceal valuable materials like diamonds. Because of this, the piriform fossa is also referred to as smugglers fossa. The piriform fossae are dangerous sites for perforation by an endoscope. A malignant tumor of the laryngopharynx (hypopharynx) may grow in the space supplied by the piriform fossa without producing symptoms until the patient presents with metastatic lymphadenopathy. The ingested foreign bodies (for instance, fish bones, safety pins) are occasionally lodged into the piriform fossa. If attention isn’t taken, the removal of foreign bodies may damage the internal laryngeal nerve resulting in anesthesia in the supraglottic part of the larynx and following loss of protective cough reflex.